As the world demand for sustainable cocoa keeps increasing Blommer’s goal is to enable farmers to keep pace with the market requirements while ensuring their economic viability for generations to come. Listed below are several sustainable certifications that the Blommer Chocolate Company offers across a variety of our product lines. 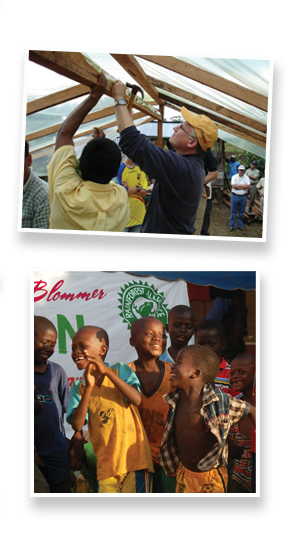 As the U.S. leader in cocoa products that are certified by the Rainforest Alliance, Blommer works with farmers to help them meet comprehensive sustainability standards that protect the environment and wildlife, as well as ensure the well-being of workers and local communities. In 2012, the Rainforest Alliance presented Blommer with its prestigious “Sustainable Standard-Setter” award. This award recognizes Blommer’s long-standing heritage of farmer-focused programs and its investment in the future of cocoa that sustains the industry, the environment and farmers’ livelihood around the globe. Fair Trade USA is the leading third-party certifier of Fair Trade products in the United States. Fair Trade USA audits and certifies transactions between U.S. companies and their international suppliers to guarantee that the farmers and workers producing Fair Trade Certified goods are paid fair prices and wages, work in safe conditions, protect the environment and receive community development funds to empower and uplift their communities. Fair Trade USA provides farmers with tools, training and resources to thrive as international businesspeople. Fair Trade is an alternative approach to conventional trade based on a partnership between producers and traders, businesses and consumers. The international Fair Trade system - made up of Fair Trade International and its member organizations - represents the world's largest fair trade system. Fair Trade is an alternative approach to conventional trade and is based on a partnership between producers and consumers. Fair Trade offers producers a better deal and improved terms of trade. This allows them the opportunity to improve their lives and plan for their future. Fair Trade offers consumers a powerful way to reduce poverty through their every day shopping. UTZ Certified wants sustainable farming to become the most natural thing in the world. The strict requirements for UTZ certified farms and businesses are closely monitored by independent third parties who assure good agricultural practices and management, safe and healthy working conditions, no child labor and protection of the environment. UTZ tracks and traces cocoa from the farmer to the shelf in the store. In demonstration of Blommer’s commitment to sustainability, we became a member of the Roundtable for Sustainable Palm Oil in 2012. The RSPO has developed a set of environmental and social criteria which companies must comply with in order to produce Certified Sustainable Palm Oil (CSPO). When they are properly applied, these criteria can help to minimize the negative impact of palm oil cultivation on the environment and communities in palm oil-producing regions.